Für den Mac gibt es ein paar unver­zicht­ba­re Hilfs­pro­gram­me, die oft von ein­zel­nen Deve­lo­pern teil­wei­se schon seit etli­chen Jah­ren ent­wi­ckelt wer­den und ele­men­ta­re Funk­tio­nen bereit­stel­len, die Apple ent­we­der ver­ges­sen hat oder ganz bewusst nicht lie­fert. Eines davon ist Paci­fist von Charles­Soft. Braucht man nicht all­zu oft, aber wenn man es mal braucht, dann kann es Mac-Leben ret­ten und ist jeden Cent von den 20 Dol­lar Regis­trie­rungs­ge­bühr wert. 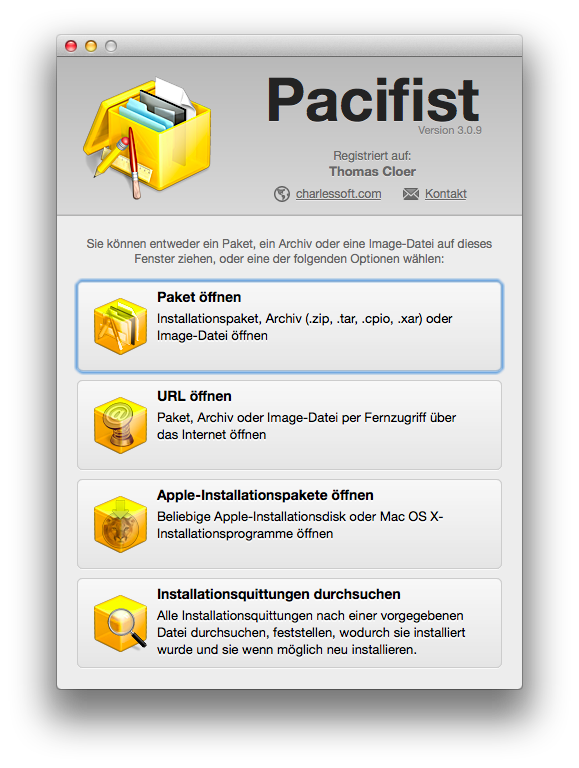 Paci­fist is a share­ware app­li­ca­ti­on that opens Mac OS X .pkg packa­ge files, .dmg disk images, and .zip, .tar, .tar.gz, .tar.bz2, and .xar archi­ves and allows you to extract indi­vi­du­al files and fol­ders out of them. This is use­ful, for instan­ce, if an app­li­ca­ti­on which is instal­led by the ope­ra­ting sys­tem beco­mes dama­ged and needs to be reinstal­led wit­hout the hass­le of reinstal­ling all of Mac OS X, or if you want to inspect a down­loa­ded packa­ge to see what it will install befo­re instal­ling it. Paci­fist is also able to veri­fy exis­ting instal­la­ti­ons and find mis­sing or alte­red files*, and Paci­fist can also exami­ne the ker­nel exten­si­ons instal­led in your sys­tem to let you see what instal­ler instal­led them, and whe­ther the instal­ler was made by Apple or a third-par­ty. THREE-DIMENSIONAL com­pu­ter prin­ters tend to be super ama­zing. They“„re also on the list of most awful thoughts ever befo­re.